This month’s textile Tuesday is going to be a fun festive DIY project that fully helps to incorporate those most important to you and showcase all you are thankful for in your décor. Have you heard of Blackboard Fabric before? I had not until I was looking for chalkboard contact paper online a few weeks back and came across the blackboard fabric. Naturally, I then changed my entire first plan and came up with what you are about to see today. This is another simple DIY project that can be completed in time for the holidays. I used some sage green burlap along with the blackboard fabric to create this runner. I am by no means an expert at sewing so even a beginner can do this. This year for the holiday the entire family is going to be spread out in different locations and I thought this was the perfect way to include everyone in the day without everyone being in one place. I collected what everyone was thankful for a few days before constructing this so I had all the information I needed when it was time to put it all together. Here is how it was done. First I determined the finished size by measuring my table and adding a bit to each end and deciding on its width. I had 2 yards of each fabric which was more than enough for my finished runner of 16”w x 58”L. I cut the blackboard fabric to that exact size. The burlap I added 2” to each side for a cut piece that measured 20”w x 62”L. Pin it all Together- I placed the blackboard fabric on top of the burlap. I then started in the middle of the long side to begin pinning (2). 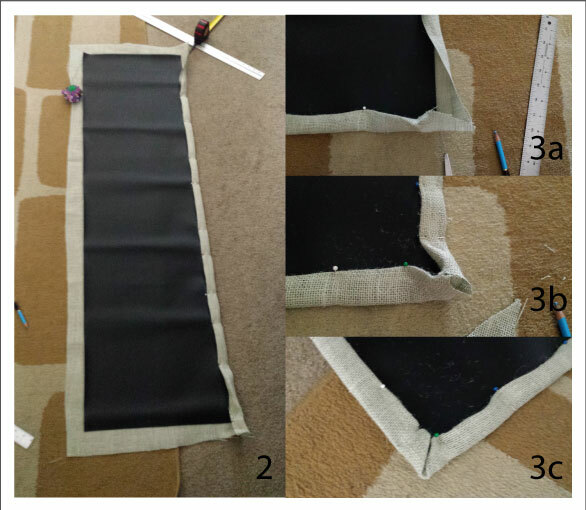 You will fold over 1” then fold 1” again over the blackboard fabric and pin in place. This gives a 1” burlap border around the finished runner and the blackboard fabric under it helps to stabilize the burlap so you do not have a floppy boarder. The blackboard part of the runner will be 14” wide when finished. The trickiest part is the corners. I pinned all the way up to the corners on each side then went back to fold them and finish pinning (3a). I cut off the excess fabric at the end and folded the corners in (3b). I really just had to play with it and pin it in place more than once before I got it right. Like I said, I am not an expert so anyone with tips on how to make a perfect corner please let me know in the comments (3c). Once you have pinned it, it’s time to sew. I decided to use black thread to go with the black center fabric and also used a decorative stitch with a vine like leaf pattern to add a little more detail. I actually love the way it came out (4). 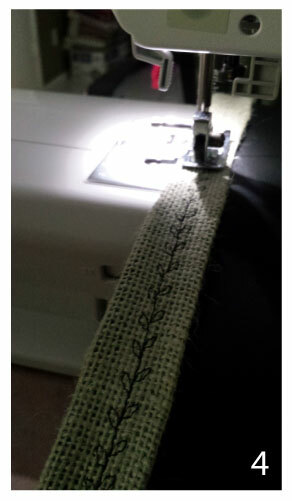 If you have never used a decorative stitch or sewn with these fabric practice on some scraps first. 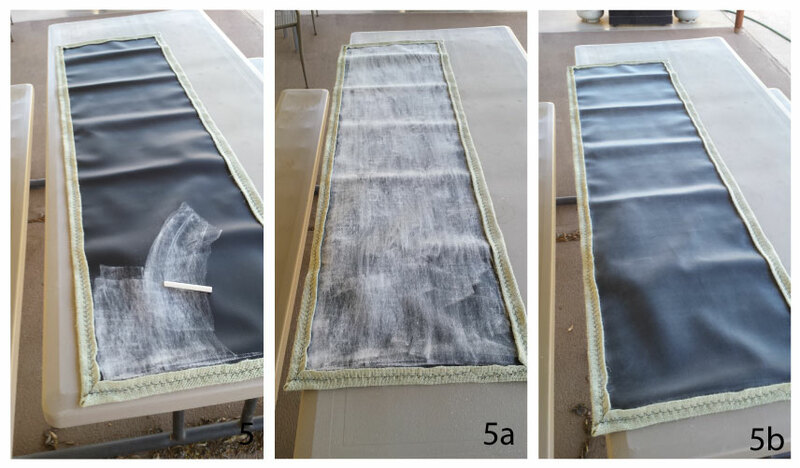 Once it is all sewn together it is time to prepare the chalkboard surface (5). You will do this by rubbing a piece of white chalk over the entire surface till it is completely covered (5a). Next you will wipe it with a dry cloth, then a damp cloth. I then buffed it out with another dry cloth to give an even appearance so you couldn’t tell the pattern it was wiped off in (5b). 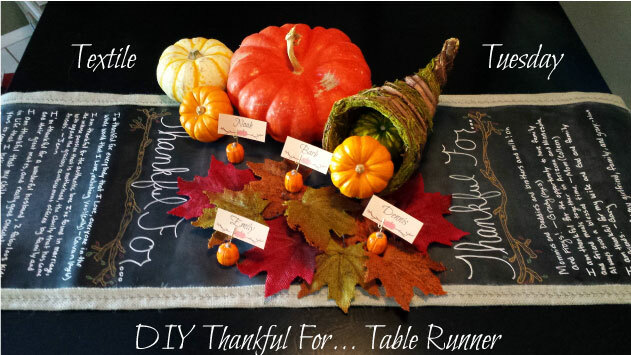 Lastly, I took it to my table and left room in the middle for a centerpiece then wrote Thankful For… on each side of the centerpiece (6). For this I used Chalk Markers. I did not want chalk dust all over the dining room table and the chalk markers are perfect for this. It looks like chalk, but does not come off unless wiped with a damp cloth. 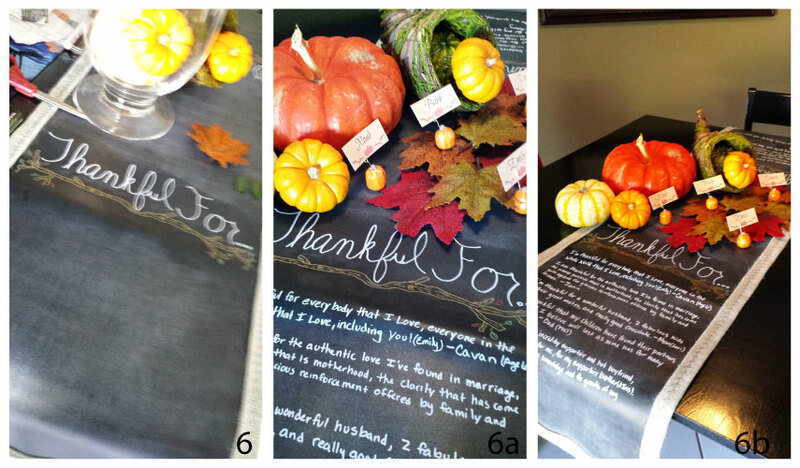 Once that was finished I began to write what different members of my family were thankful for under each side being sure to keep it even on each side of the centerpiece (6a & b). This is a great way to incorporated even family members who are in another state into your day when they can’t be there in person. It was a lot of fun to hear everyone’s answers as well, especially the kids. Make it a tradition to keep track of how everyone’s answers change over the years!